Atambayev has renewed hostilities with Jeenbekov following a phony stalemate. A spurned former president of Kyrgyzstan, Almazbek Atambayev, looks determined to go to any lengths to sabotage his successor. Even, it seems, if doing so means shredding his own reputation. In an explosive interview that aired on November 19 on his own television station, April, Atambayev implied that incumbent head of state Sooronbai Jeenbekov had violated electoral law during last year’s presidential race. The allegations are based on an alleged leaked campaign-spending spreadsheet that has had the country abuzz since last week. Nurbek Toktakunov, a lawyer-turned-activist, has suggested the document, which he uploaded to Facebook on November 15, consists of a secret set of figures showing the real level of spending on Jeenbekov’s campaign. If the spreadsheet were to be verified — and nobody has yet confirmed its certain veracity — it means Jeenbekov might have spent more than was legally permitted. Jeenbekov’s office has dismissed the document as “fake information.” Most of the public figures described in the spreadsheet as either campaign contributors or beneficiaries of the campaign have refuted claims made in the document or refused to comment. Atambayev is talking like it is a given that the spreadsheet is real. In his interview, Atambayev claimed that the accountant for Jeenbekov’s campaign, who may or may not be responsible for the leak, had fled Kyrgyzstan for fear of her life. Those running the country are now headed “down the road of the Bakiyevs,” Atambayev said, referring to the much-hated president deposed in 2010. It is comments like these that illustrate the depths to which the relationship between these one-time allies has sunk. 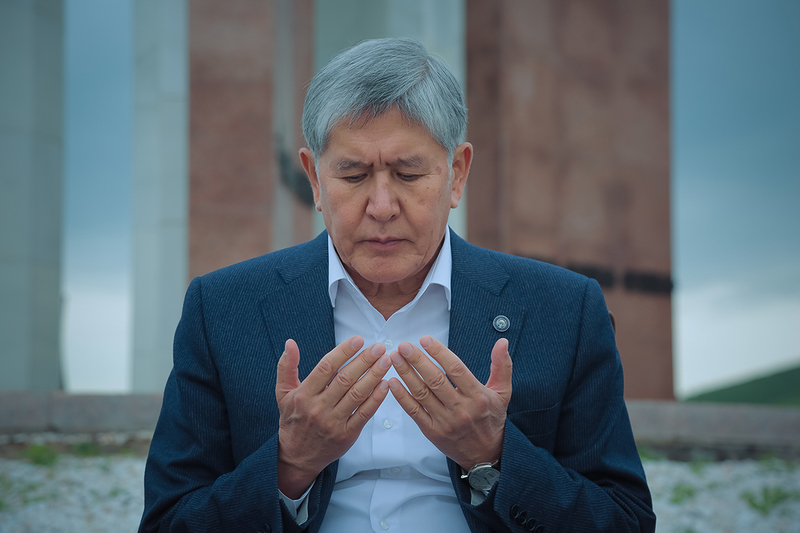 The enmity stems from a basic misunderstanding: when Atambayev stepped down, he assumed he would still be allowed to help run things from behind the scenes. Jeenbekov took a different view and steadily and aggressively sidelined his old friend. Some weight was lent to the plausibility of the spending violation allegations by a former advisor to Atambayev, Farid Niyazov, a member of the presidential apparatus inherited by Jeenbekov’s team. Niyazov, who no longer works for Jeenbekov, acknowledged that “official events and names in the published document are real.” The credibility of those remarks was undermined, however, by Niyazov’s insistence that he had no specific knowledge of how campaign finances were used. And while Toktakunov is no admirer of Atambayev, which should bolster the believability of his claims, it is important to note he is also a partial player in this drama. His main professional engagement at the moment is as a legal representative to ex-Prime Minister Sapar Isakov, who was jailed earlier this year on corruption charges amid the escalating behind-the-scenes battle between Atambayev and Jeenbekov. Isakov was one of Atambayev’s most dependable allies. When Atambayev left office last year, having served his single permitted term in office, Isakov fulfilled the role of a holdover political heavyweight implicitly charged with serving as a proxy for his mentor. In addition to sowing suspicions of electoral shenanigans, Atambayev’s bombshell remarks also had the effect of overshadowing publicity-shy Jeenbekov’s first exclusive interview to the media. Speaking to 24.kg in an exchange published on November 16, Jeenbekov opened up for the first time about his spat with Atambayev. Confirming what many have long suspected, Jeenbekov revealed that he had felt ambushed when Atambayev suddenly began tearing into his new administration in a fiery press conference in March. Atambayev’s efforts “to direct my actions via third parties” — an apparent allusion to high-profile holdovers like Isakov — were especially undignified, he told 24.kg. The Jeenbekov interview, however, was just as notable for the questions that were not asked as for the ones that were. There was no reference, for example, to new and old allegations of campaign violations. Last October, independent media outlet Kloop published a report detailing how the Jeenbekov campaign likely exploited private data of citizens held on government servers in order to better target the electorate. But Atambayev need not be too smug about all this. In his farewell press conference as president, when he was still friends with Jeenbekov, he intimated darkly that grave consequences awaited Kloop for all its journalistic meddling. Now that the situation has changed, he is seemingly content to dust off allegations of wrongdoings that occurred under his watch just to embarrass his ally-turned-antagonist.